If you are a parent to a newborn or a toddler, you know how tough life gets just to step out of the house. You basically need to carry all of your child’s essentials along with you no matter how short your duration is. It’s impossible to carry all the stuff in a regular bag since everything gets messed up and is too chaotic to handle. That’s how diaper bags gained popularity. As times changed, so did the diaper bag. Early on, diaper bags were used just for its intended purpose. They barely had any designs on them and had a very boring shape. In the present day, people are highly conscious about what they wear and hence, also need a bag to match their attire. But very few managed to get the perfect blend of a trendy and chic looking and a very roomy and organized diaper bag. So, if you are amongst those parents who need a perfect balance of the two, then you’re in luck. That is because today, we will be reviewing the Skip Hop Duo Signature Diaper Bag. This bag has all the capabilities of a diaper bag yet does not look like one. It is so stylish that people will actually assume it is a regular outdoor bag or a laptop bag. In fact, this version of the bag is an upgraded version of the previous Skip Hop Duo bag. They took all the suggestions and opinions from parents and tweaked the design a little to suit everyone’s needs. Skip Hop Duo is quite a well-known brand, and this diaper bag sits at the same standard. Its design and functionality have been well thought of. But before we speak about how amazing its functionality is, let us give you some information about this bag’s physical attributes. The Skip Hop Duo Signature Diaper Bag’s dimensions are 13 (L) x 4.25 (W) x 13.75 (H) inches and weighs about 1.4 lbs. This bag is made from a strong and durable polyester material which is free from BPA and Phthalate. Cleaning this bag will not be a problem as well since you can just use a damp cloth to wipe down any dirty spots on it. What intrigues us the most is this bag’s trendy and easy-on-the-eye design. It comes in color dark grey that can complement any clothing that you are going to wear. The installed black zippers, as well as the black handles, compliment the bag’s main color. This bag is ideal if your child is about a year old to about four years old. The company has also put in quite some thought into providing the parents with optimum storage space in the bag. You will find ten pockets altogether on this bag, which is inclusive of the two elastic mesh pockets that can be found on each side of the bag. They are capable of fitting any baby bottle that has a regular size. There is one massive compartment in this bag that stores all your belongings. It comes secured with a durable zipper closure. There is also a space allotted for each of your items to be placed in the bag so that it always remains organized. There are two, easy-to-access, front pockets which are perfect for storing things like wet wipes. Likewise, the space inside is big enough to store your tablet or even your laptop. On the bag, they have added a custom hardware with a D-ring that you can use for hanging toys, keys or a pacifier pocket. It comes with a cushioned changing diaper pad as well. In terms of carrying it around, this bag has grab handles, as well as an adjustable shoulder strap with a slip-on shoulder pad. It also has patented shuttle slips, which help in transitioning the bag from a carry bag to a stroller bag. It easily latches on to the stroller too. It has a trendy design and the shape of the bag makes it look like any other regular bag. You won’t have to struggle with attaching this bag to the stroller as it practically latches on to it, which is mainly due to its patented stroller clips. They ship this bag along with a cushioned changing pad. Unlike traditional diaper bags which are massive in size, this bag is very compact and will store conveniently anywhere. This bag is available in several different designs. It comes with an easy-to-slip shoulder pad. It has mesh pockets that are very elastic. It can be converted from a carry bag to a stroller bag and vice versa. If you have twins, then this bag is certainly not for you. It is deeper than most other bags, so if you have placed something right at the bottom, you will have a little difficulty finding them. There are no insulated pouches in or on this bag. You will have to buy one separately. There is no exclusive compartment to store the baby’s clothes in this bag. To summarize, the Skip Hop Duo is a compact yet roomy and stylish diaper bag that will store all your baby’s things comfortably. The Diaper Bag by Hip Cub Weekender Tote, just like the Skip Hop Duo Signature Diaper Bag, is a product that also comes with several pockets. However, it only has nine pockets and does not have mesh pockets. It also has both a grip handle and a shoulder strap, but the slip-on pad for the shoulder is absent. Both items can be placed on the baby’s stroller, but for the Diaper Bag by Hip Cub Weekender Tote, you still need to attach the provided stroller strap. 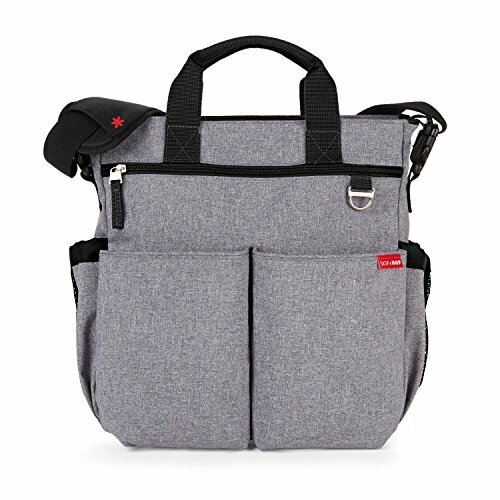 It goes without saying that the multi-pocket Skip Hop Duo Signature Diaper Bag is a must-have if you need a diaper bag that serves all of its purposes while it looks trendy. Apart from having a lot of compartments, your comfort has been prioritized since it comes with a shoulder pad and a D-ring. Likewise, your baby’s safety will also not be a worry since it is made with BPA- and phthalate-free material.